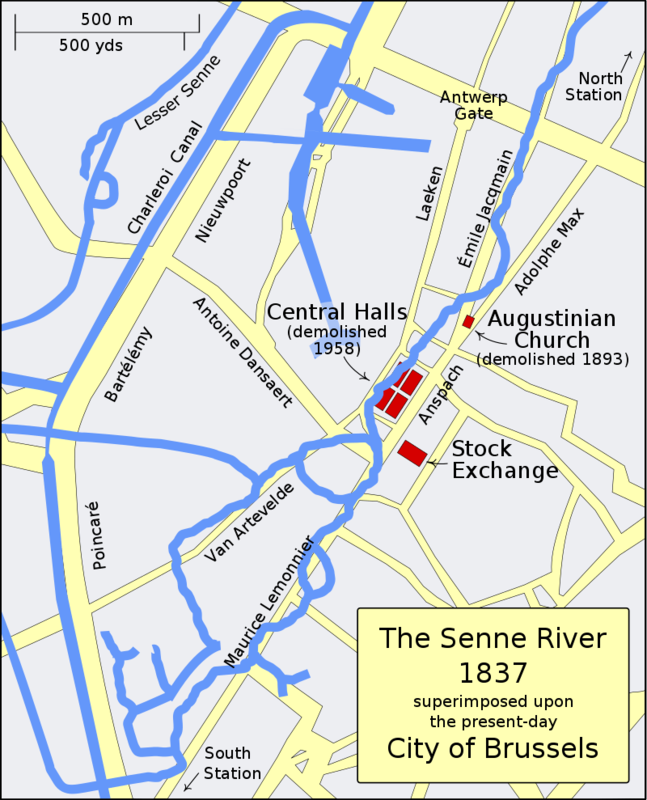 On this date in 1867 work began on covering of the Senne river in Brussels (French: Voûtement de la Senne, Dutch: Overwelving van de Zenne), involving the covering, and later diverting, of the main river of Brussels, and the construction of public buildings and major boulevards in its place. It is one of the defining events in the history of Brussels. The Senne/Zenne (French/Dutch) was historically the main waterway of Brussels, but it became more polluted and less navigable as the city grew. By the second half of the 19th century, it had become a serious health hazard and was filled with pollution, garbage and decaying organic matter. It flooded frequently, inundating the lower town and the working class neighborhoods which surrounded it. Numerous proposals were made to remedy this problem, and in 1865, the mayor of Brussels, Jules Anspach, selected a design by architect Léon Suys to cover the river and build a series of grand boulevards and public buildings. The project faced fierce opposition and controversy, mostly due to its cost and the need for expropriation and demolition of working-class neighborhoods. An embezzlement scandal by British contractors delayed the project, but it was still completed in 1871. Its completion allowed the construction of the modern buildings and boulevards which are central to Brussels today. 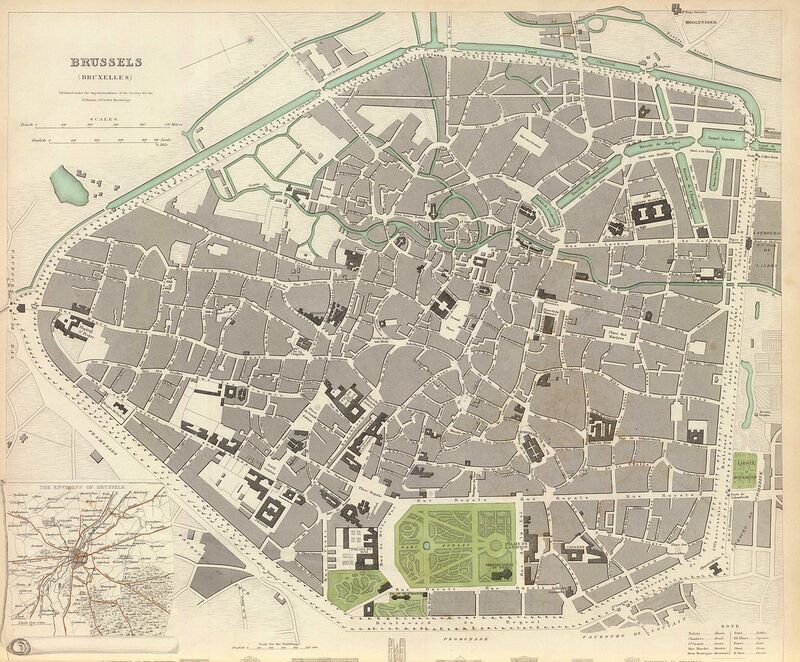 At the beginning of the 19th century, Brussels was still in many ways a medieval city. The royal quarter in the upper town, inhabited mainly by the nobility and the richer members of the bourgeoisie, was upscale and modern. The rest of the city, however, in particular the lower town, located in the western half of the Pentagon, was densely populated and industrial, characterized by a haphazard street layout, back alleys, narrow streets, and numerous dead ends. The Senne river split into two branches at Anderlecht, penetrating the Pentagon, the former site of the second city walls, in two places. The main and more southern arm entered through the Greater Sluice Gate, near today’s Brussels-South railway station. The smaller northerly arm entered through the Lesser Sluice Gate, near today’s Ninove Gate. The courses of the two traced a meandering path through the city center, forming several islands, the largest of which was known as Saint Gaugericus Island. The two branches met up on the north side of Saint Gaugericus Island, exiting the Pentagon one block east of Antwerp Gate. An artificial arm, called the “Lesser Senne” (French: Petite Senne, Dutch: Kleine Zenne) continued on the borders of the Pentagon in the former moat, outside the sluice gates. It followed the Charleroi Canal before rejoining the main part of the Senne north of the city. Many unsanitary and unsafe wooden add-ons projected over the river in the lower town. The Senne had long since lost its usefulness as a navigable waterway, being replaced by canals, including the Charleroi Canal. The Senne had always been a river with an inconsistent flow, often overflowing its banks. In times of heavy rainfall, even the sluice gates were unable to regulate the flow of the river which was often swollen by numerous creeks flowing down from higher ground. Making matters worse, within the city the river’s bed was narrowed by encroaching construction due to demographic pressure. The supports of numerous unregulated bridges impeded water flow and caused water levels to rise even further, exacerbated by a riverbed of accumulated waste. 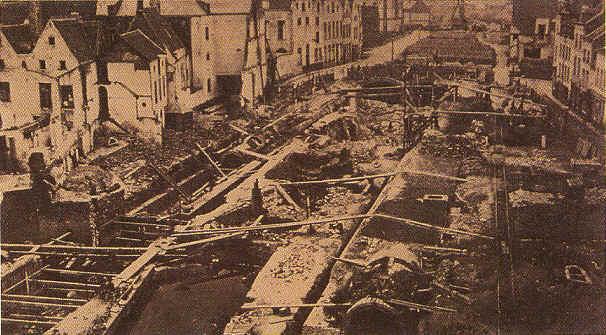 During dry periods, however, much of the Senne’s water was diverted for the needs of the populace of the city, as well as to maintain the water level in the Charleroi Canal. This left a flow too feeble to evacuate the filthy water, leaving the sewage, garbage, detritus and industrial waste that had been dumped into the river to accumulate in the stagnant water. 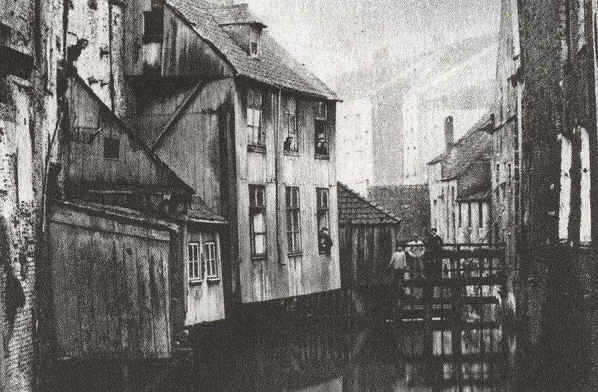 The Senne, which a witness in 1853 described as “the most nauseous little river in the world”, had become an open-air sewer spreading pestilential odors throughout the city. Early in the second half of the 19th century, Brussels saw numerous dry periods, floods and a cholera epidemic, caused as much by the river itself as by the poverty and the lack of hygiene and potable water in the lower city. This forced the governments of the province of Brabant and the city of Brussels to act. The first studies and propositions to clean up the river date back to 1859, and during the following years, many different commissions of engineers were assigned to examine possible solutions. Dozens of different ideas were submitted, many of which were completely unfeasible. Several of them proposed diverting large amounts of cleaner water from other rivers upstream to dilute the Senne, while greatly improving the drainage system in the city. Other proposals involved diverting the main course of the Senne completely to the Lesser Senne, which would then be enlarged and thus more useful for boat traffic and mills. Others considered any sort of sanitizing impossible, and proposed covering the Senne without greatly changing its course. Among these was a proposal to double the size of the underground drainage tunnels, creating space for a subterranean railroad tunnel. The idea was ahead of its time, but would be implemented a century later. The municipal council chose the proposal by architect Léon Suys, submitted in 1865, which had the backing of mayor Jules Anspach. The plan involved suppressing the secondary arm of the Senne by closing the Lesser Sluice Gate. The main branch would be channeled into underground tunnels, to be placed directly beneath a long, straight 30 m (100 ft) wide boulevard, stretching from the Greater Sluice Gate to the Augustinian church (now De Brouckère Square) before splitting into two. One branch was to head towards the Brussels North railway station and present day Rogier Square, the other towards Antwerp Gate, thus forming a long, narrow “Y” shape. 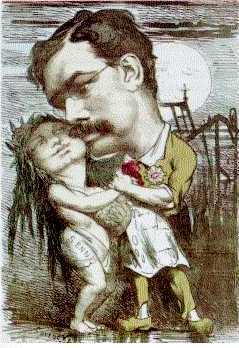 Anspach’s backing of Suys’ proposal was a calculated decision, as he had radical plans to transform the city. Anspach saw the proposal as an unexpected boon, as it allowed him to accomplish several of his goals at once. It had long been his ambition to transform the impoverished lower city into a center of business and commerce, suitable for a modern capital (Belgium had declared its independence in 1830, with Brussels as its capital). He wanted to attract the middle class, most of whom had left the squalid town center for the cleaner suburbs, including the Leopold Quarter (now often called the European quarter) and Avenue Louise, causing a huge loss in tax revenue for the city. The elimination of the numerous alleys and dead-ends in the lower town in favor of a large, straight, wide, open-air boulevard, linking the two rapidly growing train stations, seemed both a necessity and an opportunity to beautify the city and improve both traffic circulation and hygiene. The contract to begin work was signed on 15th June 1866, and the expropriation of the first 1,100 houses was completed in a few months. The work began on 13th February 1867. There were several technical difficulties that delayed the covering, many of which were due to the geology of Brussels, though they were not as bad as some engineers had forecast. 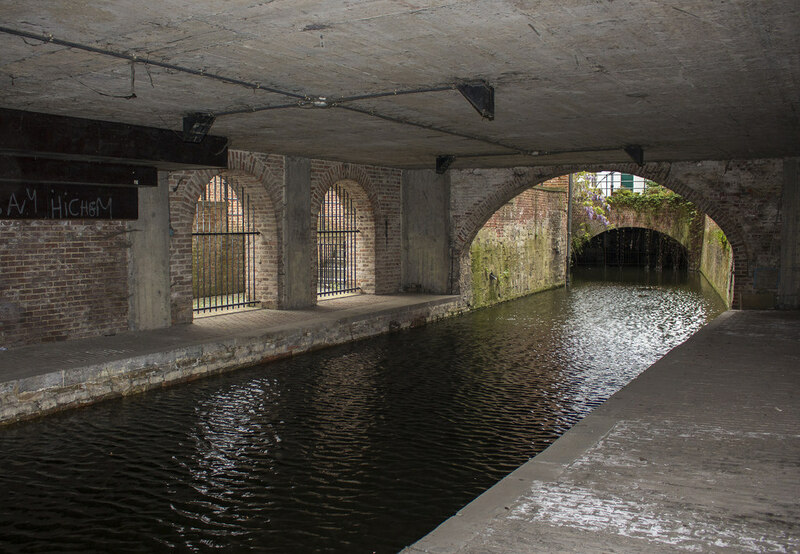 The project was completed in 1871, with the municipal council ceremonially opening the reconstructed sluice gates on 30th November. The series of boulevards created by the project – Hainaut Boulevard (now Maurice Lemonnier Boulevard), Central Boulevard (now Boulevard Anspach), North Boulevard (now Adolphe Max Boulevard), and Senne Boulevard (now Émile Jacqmain Boulevard) – were progressively opened to traffic from 1871 to 1873. 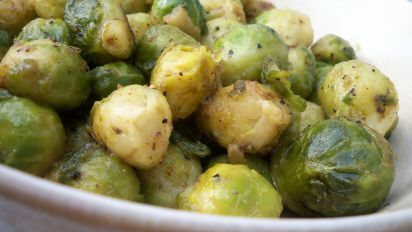 Today’s recipe has to be Brussels sprouts – treated in a Flemish manner (sorry Walloons), by being steamed then fried in butter with some onions and a little nutmeg. I was never a big fan of Brussels sprouts as a lad, but I came to like them as an adult. Steam the Brussels sprouts for about 8 minutes. Meanwhile, melt the butter in a large skillet and add the onion. Cook over medium-high until soft. Add the Brussels sprouts and cook 3-5 minutes to brown lightly, stirring occasionally. Season with nutmeg, salt & pepper to taste.